The Campaign to Save the Boundary Waters has reached a critical turning point. The Departments of Agriculture (via the U.S. Forest Service (USFS)) and Interior (via its Bureau of Land Management (BLM)) are asking for public input as they consider whether or not to consent to the renewal of two expired mining leases. Unless both agencies give their consent, the expired leases are void. 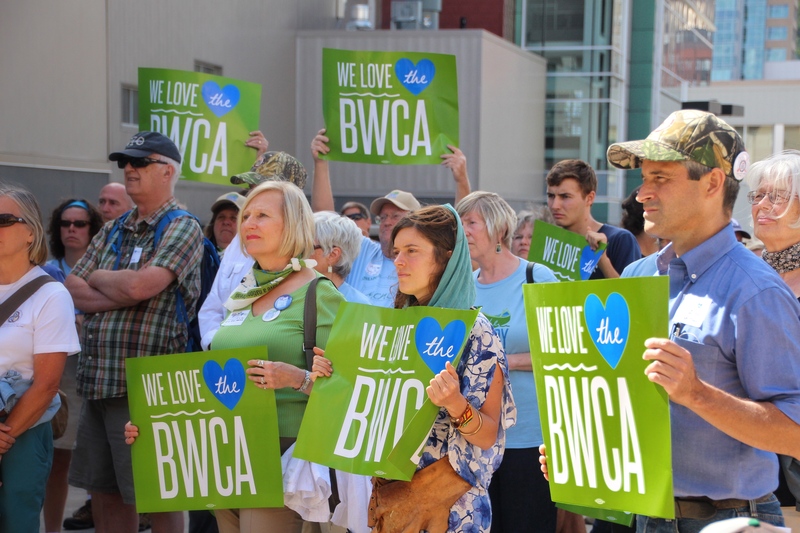 Without leases, the extractive hopes of Chilean copper mining giant, Antofagasta, and its Minnesota subsidiary, Twin Metals, for a sulfide-ore copper mine located next to (and in the watershed of) the BWCA, will come crashing down. This is where you come in. As a lover of the Boundary Waters, Quetico Provincial Park, and Voyageurs National Park you should now, please, urge the USFS and BLM to withhold their consent and also to withdraw all the federal mineral rights within the watershed of the BWCA from the federal minerals leasing program. On June 1, 1966, the BLM granted two identical leases to International Nickel Company (INCO), leases which are located within miles of what is now the Boundary Waters Canoe Area Wilderness. Each lease had an original term of 20 years, with the possibility of three renewals for ten years each. Combined, the two leases cover roughly 5,000 acres of the Superior National Forest and, more importantly, the federal minerals underneath. The leased acres are located immediately to the east of the Kawishiwi River and Birch lake, and to the west of and beneath Birch lake. Both lake and river flow directly into and through the heart of the BWCAW reaching the Quetico Provincial Park and Voyageurs National Park. The leases were renewed twice, first on July 1, 1989, and again on January 1, 2004. At no time did INCO or Twin Metals ever begin to produce (i.e., to actually mine) during the primary (20-year) term of the leases, or during either of the two ten-year renewals. In October, 2012, Twin Metals applied for a third 10-year renewal, claiming an automatic right to the third renewal. The BLM, in the course of considering Twin Metals’ application, asked the Office of the Solicitor (the Interior Department’s top lawyer) whether a third lease renewal was required as Twin Metals claimed, or instead up to the discretion of the federal agencies. On March 8th, 2016, the Solicitor issued its determination in a substantial document called an M-opinion, which includes a summation of the facts and the legal analysis that supports and explains the government’s decision. The Solicitor’s M-opinion concludes that mining company Twin Metals Minnesota has no legal right to a third renewal of the expired mineral leases. Rather, whether to renew the expired leases is a decision within the discretion of Secretary of the Interior, and the USFS as surface land manager. The M-opinion explains, painstakingly, that under the terms of the original leases the lessee (now Twin Metals) is entitled to three successive 10-year renewals of the leases unless at the end of the original 20-year lease the lessee has not begun production (i.e., mining). The leases allow the Secretary of Interior to grant an extension of time for the commencement of production, but the lessee is not entitled to any subsequent lease renewals unless production begins during the extended time. Production has never begun – not during the 20-year primary term, nor during the first lease renewal term. In addition, the Secretary of Interior did not grant an extension of time for beyond the primary lease term for commencement of production. As a result, Twin Metals has no legal right to an automatic third renewal of the expired leases. That leaves the decision of whether to renew the expired leases in the hands of the BLM and USFS. The BLM has asked the USFS whether it will consent or not to consent to renewal of the leases. The USFS has a right to withhold its consent and if the agency does, then the leases are as good as terminated. Before making a determination on the question, the USFS set out a 30-day public input period, and first one then another public listening session. The first of which was held in Duluth on July 13 (pictured above, watch the livestream here) and the second of which is scheduled for this coming Tuesday, July 19, in Ely. Please provide your input by signing the petition and, if you possibly can, by attending the listening session. For more information on how to attend the Ely listening session, click here. Matt Norton is the Campaign's policy director. He previously worked as campaign director with Minnesota Environmental Partnership, and as forestry and wildlife advocate and staff attorney for the Minnesota Center for Environmental Advocacy.